Rediff.com » Movies » Get ready for Farah Ki Daawat! 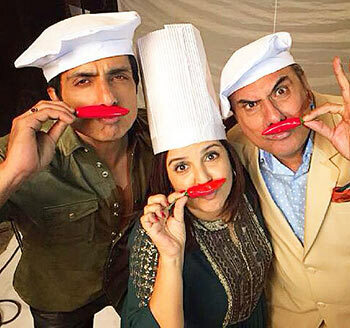 Get ready for Farah Ki Daawat! After Bigg Boss 8 Halla Bol, Farah Khan is all set to host a cookery show called Farah Ki Daawat. Farah's Happy New Year actors Sonu Sood and Boman Irani recently shot for the show, and tweeted about it. 'Thanks a ton for the best DAWAT ever. @TheFarahKhan .. Never knew me n @bomanirani r such good crooks..oops..COOKS,' Sonu Sood tweeted with a picture (left). The show will air on Colors from February 22. Esha Gupta: Today on MahaShivaratri pls don't waste al the milk on gods statues,rather give it to the animals on the street or kids.ur God will bless u.
Raveena Tandon: Aap Sab ko MahaShivratri Ki Hardik shubhkaamnaye !! Today also happens to be my dads 80 th birthday!! So truly a special day for me. Actress Amy Jackson, who was recently seen in Shankar's I, will now romance Akshay Kumar in Singh Is Bliing. The film will be directed by Prabhudheva. Sonam Kapoor and her younger sister Rhea will launch a fashion brand called Rheson in September. Shobhaa De: *@#* Pahlaj Nihalani. And that's open to interpretation! Sudhir Mishra: Come all my fellow film makers. Let us all get banned together. The film is being directed by Rana Bhatia. Photos: The world's SEXIEST party is on!